The great Value start up pack for Young Cricketers! This kit set is perfect for a start up cricketer, providing them with all of the kit they will need, at a great price without sacrificing qua.. The great Value start up pack for Young Cricketers! 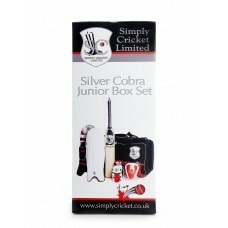 Your PREMIUM Silver Cobra Box set will include; 1x Grade One English WIllow Cricket Bat 1x Junior Pads 1x Junior Gloves 1x Ju..